If you don't want other network computers and devices to find your Windows PC, you can simply do it by turning off Network Discovery on your computer. Network discovery is a Windows feature which lets your PC to see other devices on the LAN and let others see your PC too. If you turn off network discovery on your PC, you will be invisible to other devices on the LAN. The downside is, your computer will also not find any other devices on the LAN. So if you are OK to be invisible to other devices and be ready to don't find other too, proceed further. View Control Pavel icons by Large icons. Check Turn off Network discovery under current profile. You may need to click on chevron to expand the current profile. After selecting the radio button to turn off network-discovery, other devices in the LAN will be prevented from seeing your laptop. 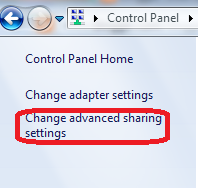 This may make file and printer sharing a little difficult between your laptop and another device in the LAN because you are invisible to them. If you do not share anything with other devices, this feature is additional security for you. If you are sharing resources with others, these settings will make you work difficult. To make your computer visible to other devices connected to the same LAN, follow the steps1 to 3 and then select the checkbox Turn on network discovery. Now onwards there will be no issues for other devices in the same LAN to see you. We have seen how simple to make a windows computer invisible to other other members in the same LAN. Similarly, it is very easy to enable default user logon picture to all users in a laptop. To learn the trick click on the link below.